Ska-reggae collective New Town Kings are an Essex-based band of upstarts who emphatically blend old-school Jamaican rhythms with a fresh dose of UK- inspired ska. The nine-piece’s first musical offering, 2007’s ‘Sound of the New Town’, demonstrates their expert ability to create party-fuelled ska anthems – with offbeat guitars and swirling horns aplenty. The nine-piece have rarely taken it easy it when it comes to travelling the world with their own brand of ska, having clocked up over 500 shows across 10 different countries since their formation. Their punk-rock ethic and extensive touring schedule has seen them perform at the likes of Boomtown Fair, Secret Garden Party, The HMV Forum and a whole host more – and the New Town Kings tour bus shows no sign of slowing down with further plans in progress for 2018. Having received widespread acclaim from the likes of Punktastic, the bands latest material has gained the attention and approval of BBC 1Xtra’s reggae- hotshot David Rodigan MBE – an influential figure in the world of reggae. 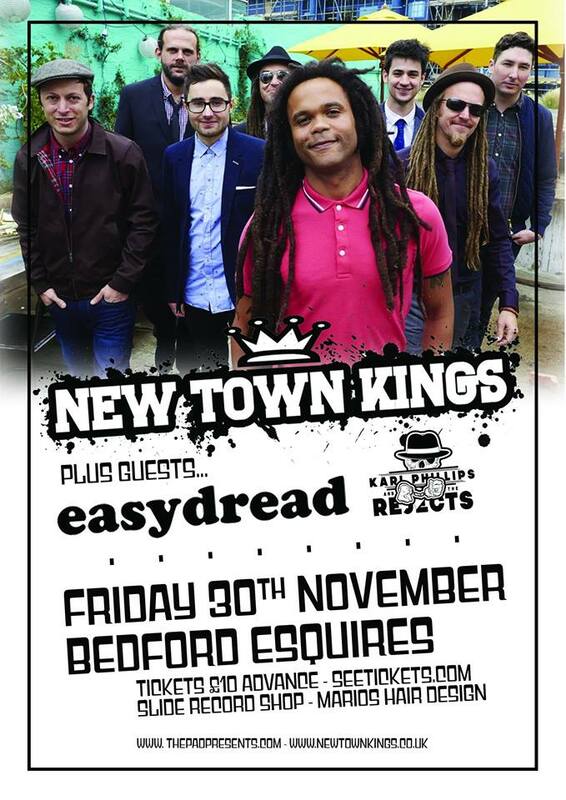 Support comes from two of the areas finest, with Easydread and Karl Phillips & The Rejects taking to the stage. Available from Slide Record Shop, Esquires and Marios Hair Design from Tuesday 11th September.